OEM -> ODM -> OCM? The OEM supply chain model has been in existence in multiple industries including computing for a long time. In the computing industry, Original Equipment Model (OEM) was perhaps kickstarted in a formal way in the 1980s with the emergence of the PC and Intel with its processors. Prior to the PC and perhaps the Apple Mac, in the 70s, computing was delivered by vertically integrated companies. Notable ones are IBM, DEC, Prime, ICL (England), Wang, Sperry, Burroughs etc. The OEM model led to the separation of the various layers in the delivery chain. Specifically, the chip (or processor) as a business came into full force and the separation of the processor, software (Microsoft) and the delivery of these two as an integrated platform led to the emergence of the OEM business. Over the past 30 years, the OEM model was supplanted by the ODM (Original Design and Manufacturing) companies (like Quanta, Tyan) from Taiwan and China. That model was perhaps kickstarted in the late 1990s driven by Intel and emergence of the Taiwan/China manufacturing capabilities. This model exploded from 2000 onwards with the emergence of the cloud companies as the end customer. The value in OEM model is the integration of either silicon (engineered by the OEM) and/or Software. Typically both Silicon and Software (as demonstrated by companies like Sun, Cisco, EMC, SGI and many more). Over time, the consolidation of the silicon (for processors, it was Intel, for switches – it is Broadcom) combined with the emergence of open source software (Linux to start with, but perhaps a whole lot of other components that is found in apache.org) has eroded the key value proposition. After 30 years, with the consolidation in the industry (EMC/Dell as an example), has the OEM model run its course? 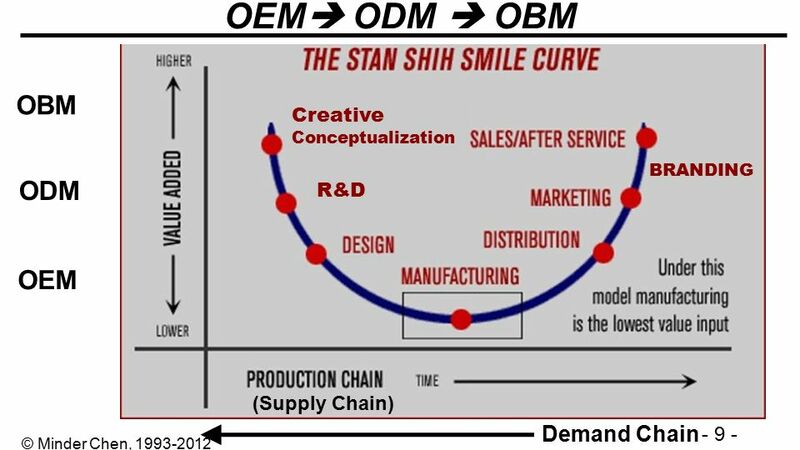 The value in the ODM model is in the manufacturing (cost-effective) and scale. To some extent the ODM model eroded one of the key capabilities of OEM given the consolidation of key semiconductor components (processors, switch/networking ASIC, storage controllers). But the inability of the ODM companies to move up the value chain (either own the silicon or the key SW IP), they have reached a plateau with nowhere to go but continue to manufacture at scale and do it cost effectively. The notion that an ODM can disrupt the OEMs has not happened. Sure, they have had an impact on many companies, but the 70/30 rule applies. The OEMs that have had strong band equity, have retained their position and the only the smaller OEMs have lost their business to ODMs. Here’s a simple visual of the value chain. But is it time now for the emergence of a new model? The OEM model is now facing a perfect storm. . One component of the perfect storm is the cloud as a business. The second disruptor is the emergence of Software Defined X (Compute, storage, Network) and in many cases tied to open-source . The third element of the disruption and the main disruption is the value shift to the component i.e. the semiconductor component. This I would term as the emergence of the OCM model. OCM stands for Original Component Manufacturer as typified by companies like Intel, Broadcom but the more interesting ones are Seagate, Western Digital, Micron, Samsung. The visual above show the three different supply chain models. The OEM model relies on the ODM as well to deliver the end system to the customer. The OCM model as typified by component companies (one good example is Mellanox – which sells chips and switches) leveraging either 3rd party or open source software to deliver system level solution to the same target customers that OEMs have addressed. While there are significant challenges in the evolution of OCM to have the same capability as the OEM, the OCM already have customers like the big cloud providers (AWS, Google, Microsoft). with a significant portion of their business (soon to be 40%) being protected by direct sell to these cloud providers which will grow while potentially seeing reduction in profit margins. This has two effects for the OCMs. They have to find alternative higher margin (absolute margin) models as well as being able to challenge OEMs and ODMs as a good percentage of their business is already shifting to major cloud providers. So, will these OCMs emerge? Back to the Wintel model of value shifting to component and software, but in the case, the OCM becomes the integrator of the SW along with the component to deliver a complete system. Unlike the ODM, the OCM has both financial and technical capabilities to move up the value chain. Lets revisit this in 2020 and see if this happens. Update – March 2019 – Nvidia to acquire Mellanox. Both companies designs and sells chips and makes boxes. Nvidia with DGX-2 (ML boxes) and Mellanox with switches.. Author renuramanPosted on February 8, 2017 March 11, 2019 Categories cloud, ODM, OEM, semiconductor, Supply ChainLeave a comment on OEM -> ODM -> OCM?